For some people, Watch Dogs proposes a tech dystopia that's still some way off. But for everyone else, its vision of an interconnected, exploitable Chicago is all too real. 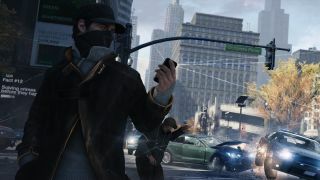 The game, which will hit the PS4, Xbox One and Wii U as well current generation consoles, focuses on vigilante Aiden Pearce who can hack into the city's central operating system via his smartphone and wreak various types of tech-based havoc. So is Watch Dogs a warning of smart city dangers that lie ahead? "I would say it's more a wake up call than a warning," the game's creative director Jonathan Morin told TechRadar. "I don't think the technology is fundamentally bad and it's our main glorification mechanic. But I think it's one of those things where people can finish Watch Dogs and just think about it and discuss the subject matter." "Look at what IBM did with Rio de Janeiro with the Olympics," Morin added. "Microsoft has been working with New York with predicting crime…. pretty much all the systems we're building in the game are on the verge of becoming a reality in every city." "Pretty much everything you can do in Watch Dogs is real to an extent," he said. "Pretty much everything was based on reality. [Chicago] became the most surveilled city in North America They're kind of the London of America." Morin even reckons that the coverage Watch Dogs is getting could have positive implications for any would-be hackers getting ideas from Ubisoft's upcoming title. "It's actually quite cool that they're talking about it in the news all the time because it's a subject that's important for people to talk about. "So that when someone has the real power to manage those systems, when he hears the public talking about it he's going to temper stuff down."